The delicate curving invites you to take a break. 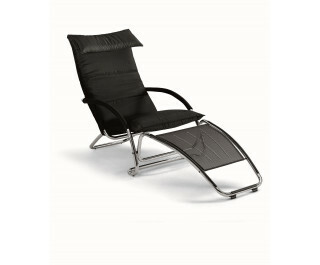 Swing, a rocking armchair featuring a contemporary design which, with a simple movement, turns into a chaise longue. The frame is made of painted or chromed steel with shrink-resistant rubber padding; the upholstery is in fabric, skay (eco-leather) or leather. In the Swing Plus version, the larger size affords further comfort. Its armrests are made of beech-wood in three possible finishes: natural, painted in anthracite grey or in mocha.